They laughed at Pudge Rodriguez. And those that didn’t laugh, tried to perform an intervention. It was the winter between the 2003 and 2004 baseball seasons. Rodriguez, in the midst of a Hall of Fame career as one of the best catchers of his era, was coming off an improbable World Series victory as a member of the improbable Florida Marlins. And he was a free agent. Rodriguez was 32 years old at the time. Generally, catchers on that side of 30 aren’t candidates for long-term, fat contracts. And unlike many receivers of his age, Pudge wasn’t interested in switching positions, like to first base or designated hitter. The Tigers were coming off the 180 degree opposite of what Pudge had experienced in 2003. They lost a franchise record 119 games, making an assault on the 1962 New York Mets’ 120 losses, which was the modern big league record for ineptitude. The Tigers, though, were tired of losing. They hadn’t had a winning record since 1993 and there were a few 100-loss seasons since then. They were a joke of a franchise. Little help on the way through the farm system. A roster filled with players who would be lucky to make the Triple-A versions of other MLB organizations. Yet Tigers GM Dave Dombrowski made a phone call to Pudge’s agent, the sartorial Scott Boras. It was late-January 2004. Don’t laugh, Dombrowski likely said to Boras, but would your client consider coming to Detroit for the next four years? 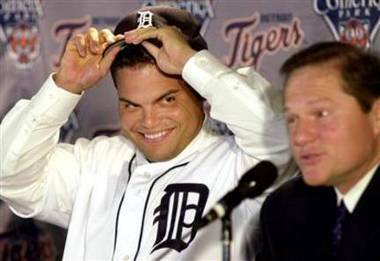 The idea of HOF-bound, World Champion Ivan “Pudge” Rodriguez signing a free agent contract with a moribund franchise like the Tigers was initially considered as being mere fantasy. But a few things combined to create a perfect storm of sorts that led to Rodriguez inking a contract with the Tigers. One, was that few suitors were out there clamoring for the services of a 32-year-old catcher—even one as talented as Pudge. Two, was that the Tigers had a low payroll and were ready to toss some cash around. And three, was Pudge’s opinion that the AL Central division was a winnable one within a couple years, if the Tigers acted quickly. The Tigers had already added mid-range free agents Rondell White (OF) and Fernando Vina (2B) in December 2003. But despite both being seasoned big league veterans, they were not going to put fannies in the seats at Comerica Park. But a superstar catcher like Rodriguez, surely would move the meter. The two sides came to terms: four years, $40 million. Rodriguez signed the deal on Feb. 6, 2004. Pudge’s former manager in Florida, the irascible Jack McKeon, publicly lamented the idea of a player of Rodriguez’s status “wasting” the remainder of his career with a team like the Tigers. McKeon’s attempted intervention failed. The perfect storm that led Pudge to the Tigers couldn’t be abated. And Pudge was right about the AL Central: the Tigers nearly won the division in 2006—the year they made it to the World Series as a wild card team. Signing star outfielder Magglio Ordonez away from division rival Chicago prior to the 2005 season didn’t hurt. Other trades that Dombrowski executed contributed to the rebirth of baseball in Detroit. But none of it happens without the stunning courtship of Ivan “Pudge” Rodriguez. I bring up the Pudge signing because today’s Tigers are going to have to make a decision sooner or later. It’s a simple question, though the answer is tricky to determine. When will it be time to seek help from outside the organization? The rebuild—or “tanking”—strategy is all the rage these days in MLB. This has resulted in precious few teams who have a legitimate chance to win in any given year. For every rebuild that is on the verge of bearing fruit, is another team that sinks below the surface—never to be heard from for years. The Tigers are in every bit of a winnable division now as they were in 2004 when Rodriguez inked with them. The Indians are still the class of the Central but they’re hardly a juggernaut, especially if they trade ace starter Corey Kluber, as has been rumored. The Twins, White Sox and Royals are all mediocre, at best. The Tigers are bad as well, but you know how you stop being bad? By signing star players. The Tigers’ strategy to let fat contracts roll off the books and groom youngsters is a sound one. But at what point do you look for outside help? The White Sox, who have a fine group of young players, are said to be looking to spend money soon. Don’t be shocked if they make a play at SS/3B Manny Machado, no matter how unlikely it would be that the Sox would land him. If the White Sox start spending money, and if the Indians appear to be slipping a tad, what do the Tigers do? The city of Detroit is begging for a sports hero with whom to fall in love. Someone exciting. Someone with an impressive resume. The teams in town are bereft of star power. The Tigers have two big contracts right now: Miguel Cabrera’s and Jordan Zimmermann’s. Miggy’s deal still has eons to go, while Zimmermann’s deal expires after the 2020 season. Coming off the books this fall was Victor Martinez’s $18 million purse. Beyond that, are a lot of mid-range to inexpensive contracts. The team payroll is at about $110 million right now. That’s not outrageous. What I’m suggesting won’t be popular, most likely. I suggest that with a lousy division, a city dying for stars and with a payroll that isn’t debilitating, the Tigers ought to consider accelerating their rebuild. First, who knows how good these kids are, that the Tigers are grooming? GM Al Avila has said that he thinks the Tigers can contend by 2021. Second, who’s going to come to the ballpark to see Grayson Greiner behind the plate? Or JaCoby Jones play CF? It’s fine to sit back and watch your team reinvent itself. It can even be endearing. And it’s a strategy that’s been proven to be successful in other big league cities in recent years. But no team successfully completes a so-called rebuild based solely on internal assets. Sooner or later, you need outside help. Read: free agents. Star ones. I’m not saying that the Tigers should replicate their pursuit of Pudge Rodriguez, by going after Machado or Bryce Harper. Though I wouldn’t cry if they did. But how much losing can the fans in Detroit stand? The last baseball post-season around these parts will be five years in the rearview mirror come next season. And the Tigers are nowhere near reversing that trend in the near future. The AL Central division is lousy. If the White Sox spend money this off-season, how much longer are the Tigers expected to sit idly by? There may be a window of opportunity here that the Tigers could regret passing up. I believe that going with youth is the right move, for now. But sooner or later, the Tigers are going to need outside help. Check that. Sooner, rather than later. Tigers fans remember all too well the years between 1994 and 2005, when the franchise was mostly lost in the wilderness. Time flies. Before you know it, if the Tigers don’t try to accelerate this thing, another decade of irrelevance will have gone by. At least. How much longer can the fans get behind the modern day version of Robert Fick, Nate Cornejo and Bobby Higginson? Come on Greg. Whatever happened to gutsy, team play? You know, like… trying harder? They can try as hard as they want. They need talent.